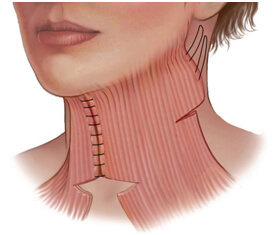 Platysmaplasty, or neck lift, is a procedure used to remove sagging excess skin under the jaw line and on the neck or to tighten the muscle of the neck if it has begun to sag or separate. Patients having a facelift will often have a neck lift as well. A neck lift is an outpatient procedure that normally takes two to three hours—unless it’s being done in conjunction with other procedures, in which case the time increases accordingly. Anesthesia will be administered via I.V. In a “skin only” lift, two incisions will be made under or behind the ear, excess skin will be removed, and the remaining skin will be re-draped. If you’re having a platysmaplasy as well, you may have a small cut under your chin in addition to behind your ear. This will allow the surgeon to tighten the platysma muscle and improve the look of the neck area. Dr. Youssef will close your incisions with sutures. A pressure dressing will be placed around the top of your head to underneath your chin. Neck lift risks may include anesthesia risks or complications, infection, hematoma (collection of blood beneath the skin), seroma (collection of fluid under the skin), neck tightness, numbness, scarring, deep vein thrombosis, and heart and lung complications. As with any surgery, the risks and possible side effects should be discussed thoroughly before committing. You will need to take it easy for a few days after your surgery; oral medications will be given to control pain for the first few days. It’s important that you keep your head and neck still after a neck lift. Your lower face and neck will get more swollen, and possibly a bit bruised, over the first three days after surgery. As the days go by, the swelling and bruises will dissipate. This is part of healing. If you have excessive pain, redness, pus at the incisions, or other symptoms that don’t appear normal, contact our office immediately!